TS EDCET 2017 Counselling Notification, Rank wise Dates, Certificates Verification, Web Options: The qualified candidates of TS Ed.CET-2017 Examination are informed to attend the certificate verification for exercising online web options for admission into two years B.Ed. 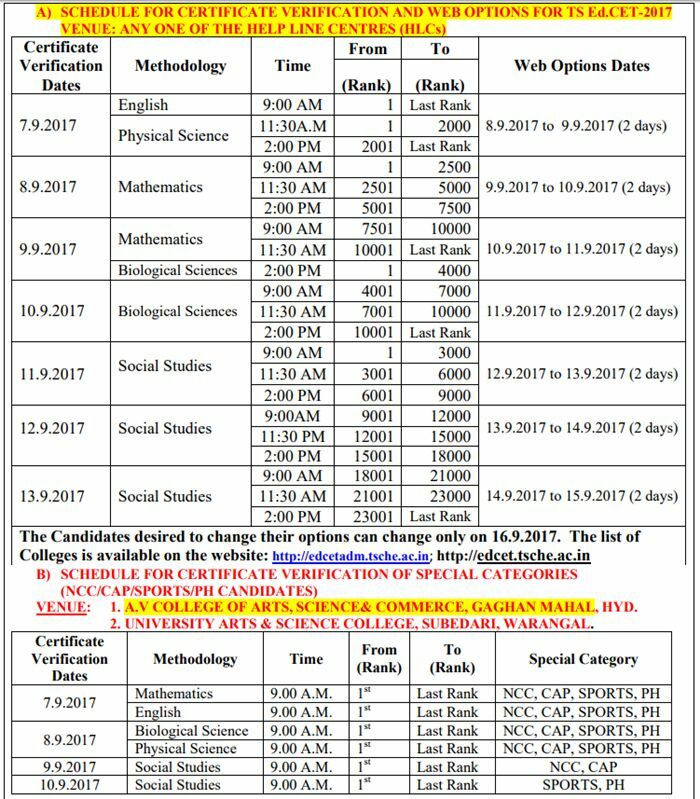 course for the academic year 2017-18, as per G.O. MS. No 24, dated: 24/08/2017, on the dates mentioned against their state-wide rank and methodology, in any one of the Helpline Centers (HLCs) (See Annexure-I) with all original certificates as detailed below. The Biometric details of the candidates captured at the time of appearing for TS Ed.CET-2017 Examination shall be verified at the Help Line Centers at the time of Certificate Verification. Therefore it is mandatory for the candidate to attend for Certificate Verification. The candidates who have not given the Biometric details at the time of TS Ed.CET-2017 Examination (list placed in the website: http://edcetadm.tsche.ac.in, http://edcet.tsche.ac.in) shall have to Register the biometric details duly furnishing an undertaking mentioning the reasons for not giving the Biometric details at the time of TS Ed.CET-2017 Examination at any of the Help Line Center as per the schedule. Special category candidates educational certificates will also be verified simultaneously at the Centre.